grandma's cookie jar: Second Blanket Finished! aliens or stars! So, I thought I'd post a photo of it for you to see! 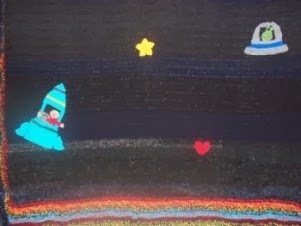 The blanket has rows of colored stripes at the top and bottom and black "space" where there is a rocket with Caleb and Gimli in it and a spaceship with an alien! I added a star and a heart to the blanket as well! It is warm - I used two strands of yarn to give color, texture and warmth - I used a variety of different black yarns for the "space" part - and just double crocheted each row until the blanket was about the same size as the one I made for Josiah. This blanket is made with love and prayers . . . I tend to pray for the people I'm making things for as I make them! Tomorrow when the boys are at my house, they will be able to open their blankets; since they both like sleeping with their baby blankets I made for them when they were born (which are both fairly small for them now) I'm hoping they will be happy to see these bigger blankets which they will be able to snuggle in for years to come!